Miss Ashley has been wearing glasses for a very long time. Born with lazy eye and near blindness on her left side, glasses have been part of her life for as long as she can remember. She has had surgery for the lazy eye, so now it is just a vision issue. 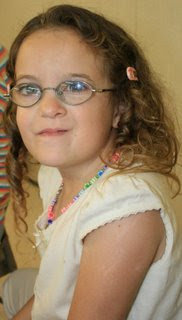 Her left eye is not correctable, so now when she wears glasses it is pretty much just to keep her "good eye" protected. We've been blessed that the glasses have never been much of an issue for her. What was an issue was when she was wearing an eye patch for lazy eye therapy. She hated and the kids at school were incredibly cruel. It was then that her glasses, or rather her differences from everyone else became such an issue. It was so hard on her and I was thrilled when the patches were no more! 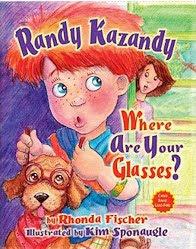 Rhonda Fischer has written a wonderful book for kids with glasses, Randy Kazandy, Where Are Your Glasses?. The book is written in an engaging, musical rhyming style, which kids seem to enjoy. It is the story of Randy who finds out her needs glasses and is not particularly thrilled by it. He continually comes up with places to hide his glasses, but his mother always seems to have another pair! His parents help Randy learn to accept himself and embrace the motto “I love being me!”. The illustrations are adorable, complete with hidden glasses throughout the pages. Even though Ashley is ten, she enjoyed the book and said it would have been nice to read when she was younger. With all her "differences" a book teaching you to love and accept yourself is a great thing for her to have. She says it gets two thumbs up and I agree! I think is a great book for all kids, glasses or no glasses. Self acceptance is important no matter what!